GTA IV still remains my favorite because of the story and Niko, who is my favorite character in the whole canon. He embodies and represents the American dream, twisted underbelly and all. Let’s get this out of the way. On almost every level, GTA V has superior gameplay and visuals. With three playable characters, the jukebox for destruction never gets repetitive. I’ve lived in Los Angeles more than a decade, and Los Santos captures the feel of L.A. perfectly (with the exception of the heavy traffic). I could even pull up to the street I lived on and pose in front of a building I saw every morning. The map is HUGE and Los Santos is a massive canvas for mayhem. There is a scale to the missions that blew me away, combining the best gangster movies with the over-the-top sensationalism and humor known to the series. Some of them included shooting down an airplane, jumping aboard a train with a motorcycle, unleashing Armageddon in military suits during the Paleto Score, and waking up in a body bag at an FIB morgue. The Three’s Company mission particularly stands out for the way it involved all three characters in a bold rescue. 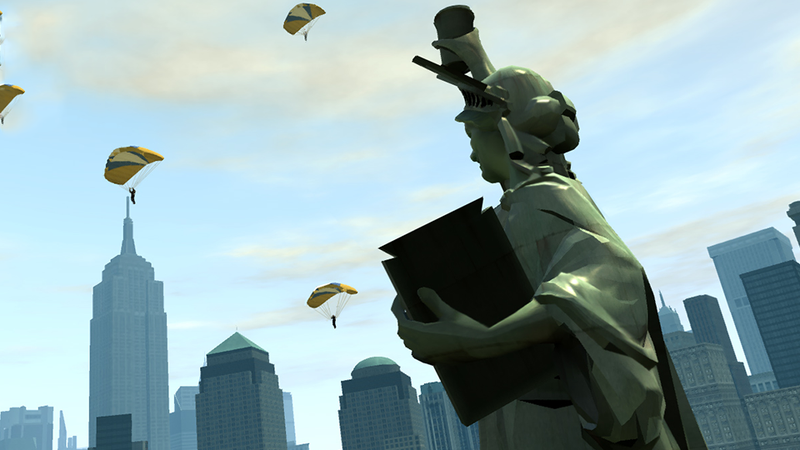 Trevor flies the helicopter to the destination where Michael rappels down a skyscraper to break out the prisoner. Franklin provides backup support as a sniper, followed by a helicopter battle that was as daring as it was unbelievable. The ambitious gameplay seamlessly melds with the latest in technology and the list of improvements from GTA IV is extensive. Driving is taut and Franklin’s special ability to slow time behind the wheel is especially helpful in aiming your weapons (something I struggled with on the driving levels in IV). Drug trips provide a strange mix to the missions (monkeys and aliens, anyone?). You can play stocks, the smartphone interface is more intuitive, the TV shows are stranger and more satirical, characters have increased customization, and there are actual mid-mission checkpoints, meaning you don’t have to restart the whole thing all over again as in GTA IV. Trevor is arguably one of the few playable GTA characters in the universe that not only gets what it means to be in the GTA world, but revels in it. He doesn’t want to be likable or sympathetic. He doesn’t want you to feel comfortable, or somehow justified in doing the horrible things you do on the streets of Los Santos. Even after the brutal torture scene in the By the Book mission, he makes it clear he only did it because he enjoyed it, not because he was forced to by the FIB. Trevor is a Joker whose Batman/audience happens to be us. We can condemn and criticize his violence and greed, but we can’t turn away. Rockstar continually pushes the edge through Trevor and challenges us in the process. But not in any obvious way, lecturing us on the moral ramifications of this or that. Instead, the message isn’t about torture or even violence and how terrible it is. It’s how dulled we are to it entirely, making violence a matter of indifference, or even worse, amusement. I’m not a war veteran, but a big part of why I relate so much to Niko’s character is because I experienced what it felt like to be an immigrant. When I was around eight, I moved to Seoul, Korea for two years. Even though outwardly I looked Korean, I could not be more foreign as I only half understood the language and couldn’t read or write it at all. Everything felt so different and the culture shock was as confusing to me as when Niko meets characters like the eccentric Brucie Kibbutz for the first time. Other students and neighbors made fun of me for being a Westerner, mocked me for being American, and told me I should go back to my country. Until then, most moral choices I’d experienced in gaming were pretty straightforward, a game mechanic tallying invisible points on some chart that would have some repercussion down the line. Be good, or evil. Rob the poor woman, or help her. This was the first time I’d ever felt tortured by a decision and it was all the more agonizing to realize it was a purely individual choice that had no impact on the gameplay or the story (the two endings would be determined by a choice made in the following mission). Darko, wracked by guilt, had gone crazy, a shell of a man that was a pitiful sight. Should I take justice and execute him? Peter Tieryas is a character artist who has worked on Guardians of the Galaxy and Cloudy With a Chance of Meatballs 2. His novel, Bald New World, was listed as one of Buzzfeed’s 15 Highly Anticipated Books as well as Publisher Weekly’s Best Science Fiction Books of Summer 2014. He’s been published in places like Kotaku, Kyoto Journal, and Tor. He tweets at @TieryasXu and blogs at tieryas.wordpress.com.